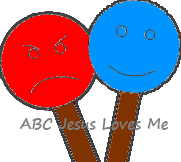 Ephesians 6:7-8 (NIV) - Serve wholeheartedly, as if you were serving the Lord, not people, because you know that the Lord will reward each one for whatever good they do, whether they are slave or free. Taking Care of Me: Where are my toes? 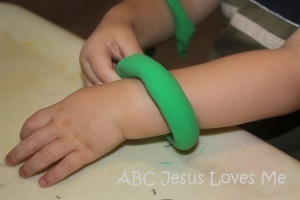 - ABC Book: Glue yellow yarn on the Infant worksheet to make straw for baby Jesus. 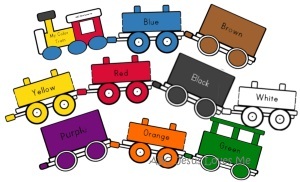 Color Train - Add a white train to your Color Train by having the child paint with minimal water the white train. Display the train at the child's level to point and discuss the colors. 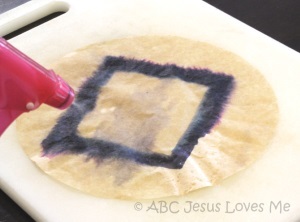 Coffee-Filter Shapes - Using a washable black marker, draw a thick-lined rectangle on a coffee filter. Spray water on the filter which will cause the ink to bleed. Let dry. - Sign "water" as you spray the water. - Using minimal water, water paint the Cat worksheet which allows the cat to remain white. - Find pictures of cats in the books that you read. - A cat says "meow" or "purr." - Crawl pretending to be a cat. This week's sign is "water." If your child refuses to do the sign, gently hold his hand and help him perform the sign as you say the word. - Count the kittens in the illustrations. - If you know the song to this book, be sure to sing it with it your child. - Make a sad face when the kittens are sad and smile with a happy face when the kittens are happy. For added learning, cut out a circle. Draw a happy face on one side and a sad face on the opposite side. Show the correct side as you read or sing the story. This week demonstrate to the child how to roll the play dough into balls and snakes. Allow the child to play with both. (Leave the play dough toys for when she is older.) Click to see my favorite play dough recipe.